Ex-Chief Rabbi Lau and son, the current chief rabbi, slam attempts to weaken Chief Rabbinate, at conference against conversion reforms. The former chief rabbi, Rabbi Yisrael Meir Lau, sharply criticized proposed conversion reforms and attempts to weaken the rabbinate in Israel. Legislation proposed by a committee headed by former Likud MK Moshe Nissim would create a state-run authority, distinct from the Chief Rabbinate, that would oversee conversions. "The Chief Rabbinate will remain like a chief of staff without soldiers, a general without fighters. For matters related to the honor of Heaven - do not retreat, do not give up, fight for truth, the truth of the Torah. What belongs to the Torah of Israel is the basis, and for this we are fighting," said Rabbi Lau. 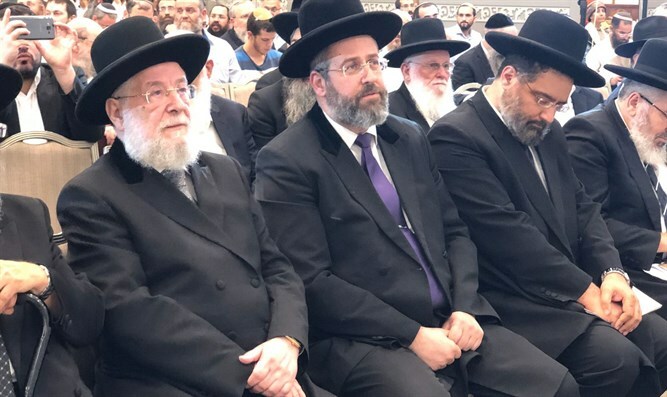 Rabbi Lau emphasized in Rabbi Nissim’s words the importance of the independence and building of the Chief Rabbinate of Israel: "Rabbis of Israel who have proved that they can withstand this status will stand firm in the future. And each of them will contribute to the complete building of the rabbinate in Israel and for the Holy Land." Rabbi Tzvi Tau, leader of Yeshivat Har Hamor, said that there is a deliberate attempt to harm the Torah of Israel. "I was asked by the organizers to read the article by Rabbi Tzvi Yehuda Kook, which was mentioned earlier. The words are also needed for this generation. They were said in the year 1961, at a conference of hundreds of rabbis of Israel. The issue was the attempt by secular elements to take control of the Chief Rabbinate, intervene in its choice, and intervene in its directives. Things are repeating themselves now that there is an attempt from a secular direction to bend the Chief Rabbinate, and in ways of politics and demagoguery to change the rabbinate and the Torah."